Today’s visitor to the blog, Debi Alper, has been here many times before as I have had the privilege of working with her on Retreat West competitions and retreats several times. But today she’s here talking to me about the wonderful Stories for Homes 2 anthology, which is once again raising funds for Shelter and helping to raise awareness of the homeless problem in the UK today. Debi, can you tell us why you decided the time was right for SfH 2? We always wanted to follow up on the success of SfH1 but struggled to find the time as it’s a huge commitment. It was clear that SfH1 had not only raised essential funds for Shelter but had also been the launchpad for several of our SfH1 authors. Mandy Berriman, for example, whose stunning short story A Home Without Moles was her first taste of being published, now has an agent and a publishing deal for the novel written in the same voice. Meanwhile, the housing crisis was becoming even more acute. Foodbank use was at an all-time high. Shoddy housing, unethical landlords, a lack of decent affordable housing – and all this before the Grenfell Tower tragedy – were impacting on more and more people. A few of our supporters were reminiscing on what a wonderful project SfH1 had been and, of course, Sally Swingewood, my co-editor, and I agreed. Before we knew it, we’d committed to doing it again. What did you learn in producing SfH 1 that has helped to make the second anthology a more high-profile project? The website has been spruced up by Rachael Dunlop, with lots of tabs added to make it a general resource on the housing crisis, as well as a source of promo for the anthology. We’ve also published a free story online every week over several months as part of an online anthology. This time, we had a lot of external help with the promotion, mainly thanks to Jacqueline Ward at Jel, who handled our social networking strategy, and we also had a multi-stop blog tour. High profile authors, Joanne Harris, Emma Darwin, Julie Cohen, Cally Taylor, Deborah Install and Tor Udall, gave us cover quotes. Thanks to the high standard we set with SfH1, many people were happy to endorse the new anthology, knowing the superb quality would be maintained. The cover, featuring original artwork by Sally, has been professionally produced by Head & Heart Publishing Services. And, of course, we had the same community of authors and supporters to help out with blogging, FaceBooking and tweeting, as well as all the practical work needed to produce a world-class anthology. How did you choose the stories for the anthology and the running order? With great difficulty! This is always the hardest part because, inevitably, we ended up rejecting some stories that were wonderfully written – many by published and/or award-wnning authors – but which we felt simply didn’t fit the anthology for a variety of reasons. We needed to establish a balance of light and dark (many of the ones we rejected tipped the balance into being too dark and we wanted the anthology to be entertaining, as well as thought-provoking). We also needed to ensure there were not too many that covered similar material. The original submssions were anonymised and once we’d made our first decisions and linked the stories with the authors, we decided we would only have one contribution per author. We ended up with 55 stories out of 256 submissions. Deciding to have free stories on the website meant that we could use some of them there but that still meant saying no to some wonderful authors. We really hope those stories find homes elsewhere. With the running order, again we wanted a balance of light and dark, short and long, subject length, etc. We used index cards and smiley faces and spread them all out on the floor, moving them round until we felt we had the right shape for the book. Do you see this as being an ongoing series to continue to raise money for Shelter for years to come? I’d love to say I don’t think it will be neccesary but I doubt if anyone really believes that will be the case. We don’t have any concrete plans but I’m sure this won’t be the end of the SfH project. Where can people find out about launch events and is there any other way they can support the project? 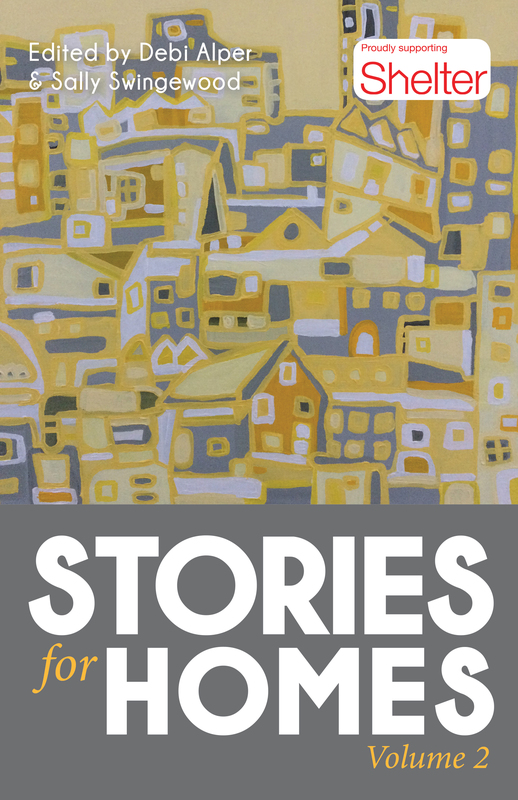 We have an events tab on our website: https://storiesforhomes.wordpress.com/events-2/ There’s a Facebook page https://www.facebook.com/StoriesForHomes/ and Twitter https://twitter.com/storiesforhomes. Please come to our events, like our page and follow us. There’s also a donate button on the website for people who want to give their money direct to Shelter. And, of course, buy the book and tell everyone about it! In fact, why not buy several copies as the perfect seasonal gift? People like you are invaluable in helping us to spread the word. Thank you! Thanks for coming, Debi. I hope the book is the huge success it deserves to be. I’ve already got my copy and there are some truly stunning stories in there. Please help support Shelter this Christmas and buy all the readers in your life a copy. They won’t be disappointed! Amanda is a novelist, short story writer and features journalist who started Retreat West in 2012.